Whether it's tagging (the stylised writing of an individual or crew's name), posters, stickers, installations, murals or mosaics, graffiti has always been a contentious issue. Countries like the US, UK and Australia have adopted aggressive - and expensive - strategies to try and eradicate graffiti. But not all cities view graffiti as a bad thing. Over the past few decades, it's increasingly become part of mainstream culture. Some places have actively promoted graffiti and encouraged artists to work in public spaces. Others, like Bogota in Colombia, have introduced legislation that aims to promote the responsible and legal practice of graffiti. In Singapore, the state has designated specific surfaces for graffiti. Johannesburg, South Africa's most populous metro, takes a dim view of graffiti. In 2016, Mayor Herman Mashaba declared that he would eradicate graffiti through stricter bylaws to create an "investor-friendly environment" in the city. His stance is arguably at odds with the City of Johannesburg's policies on urban redevelopment. These rely on programmes that support public art and promote tourism opportunities. We and our colleagues at the Gauteng City-Region Observatory wanted to know the contribution made by graffiti to tourism and the public environment in the inner-city of Johannesburg. The Observatory is an independent research organisation which generates data and analysis to help inform development and decision making in the Gauteng City-region. So we undertook a study of graffiti in Maboneng, a precinct in Johannesburg's inner city that's undergoing urban renewal. The Maboneng precinct began in 2009 with the completion of the "Arts on Main" building, an artists' space in a renovated industrial building. Over the last decade, Maboneng has become an iconic example of how investing in "creative spaces", "creative industries" and "creative tourism" can be used to drive urban renewal of previously disused or derelict urban environments. Maboneng's developers have created a strong public and street art presence, both physically and digitally. 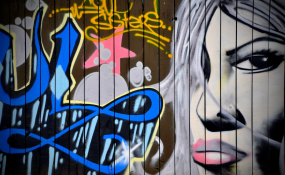 In fact, graffiti forms part of the developers' strategy for reinvigorating the area. The area now boasts several large-scale murals produced through street art festivals and artistic commissions. It's also attracted significant attention from graffiti artists. All of this contributes to Maboneng's aesthetic identity and is one of the elements that draws tourists to the area. Through visual and spatial analysis, we were able to demonstrate that graffiti has aesthetic value. It signifies the redevelopment of the neighbourhood, distinguishes the area from surrounding spaces, and projects a global aesthetic similar to that seen in places like Hell's Kitchen, New York; the east end of London or Bogota, Colombia. Large murals were incorporated into the architecture of renovated buildings. These murals were frequently accompanied by other forms of graffiti such as tagging, posters or stickers. Graffiti was present in the precinct even where buildings or public space had been upgraded. This reflects Maboneng's tolerance for types of graffiti that are more frequently viewed as undesirable. We mapped the reach of the murals on high rise buildings in Maboneng, and found that many could be seen for several hundred metres down streets - and, in some cases, beyond the boundaries of Maboneng itself. The murals announce the branding and identity of the area for the public and thus aid in making the Maboneng precinct more visible and inviting.